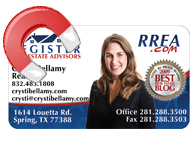 Our magnetic cards are printed with the highest quality and vibrant colors. They offer durability, extended exposure, and efficiency along with huge savings. Our magnets are printed on the most popular 17 PT magnetic stock. Only 4 Business Days Turnaround! 17 PT Magnetic Stock Full Color CMYK - 4/0 Only 4 Business Days Turnaround Amazing Print Quality Rounded Corners Size: 3.5" X 2"